Many folks understand the importance of protecting and supporting nature in our yards. Snags, brush & rock piles, plus properly maintained small bee nesting boxes are features sometimes overlooked, but can easily be incorporated into our yards to benefit wildlife. Living quarters – wildlife often live in the cavities, crevices and peeling bark of dead trees and in the crevices and tunnels of rocks both on land and in water. Storage areas – wildlife use crevices and cavities to store food, especially in the winter. Food Sources – decomposing trees and rocks attract many types of insects, fungus, lichens, and moss which are in turn eaten by many other types of wildlife. Nesting materials – the fungus, lichens and moss found on decomposing trees and rocks are often used as nesting materials. Hiding places – wildlife often hide from predators and bad weather in cracks and crevices. Hang outs – the limbs of dead trees serve as perches or breeding areas for many birds. Rocks provide basking areas for turtles, butterflies and dragonflies. 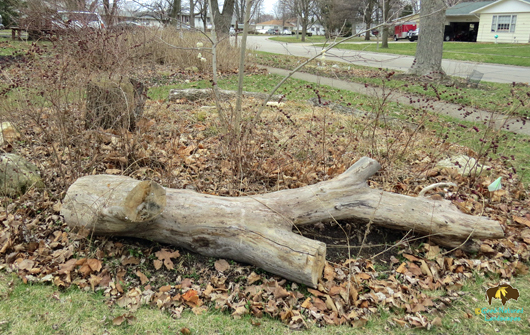 Nature’s Gold – decomposing wood and rocks contribute organic matter, nutrients and minerals to the soil.